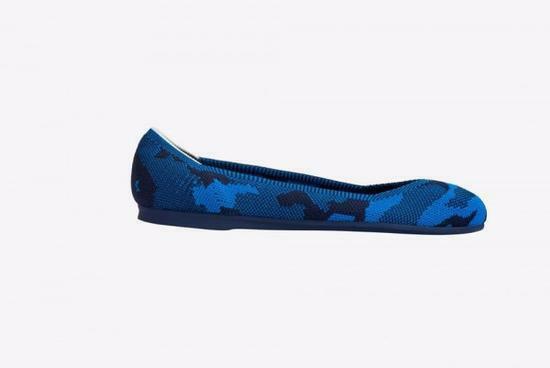 A company in San Francisco, California, has found a way to turn used plastic bottles into women's shoes. Every day, millions of Americans drink water and other liquids from plastic bottles. More than 60 million of them are thrown away each day. Many of the plastic bottles end up in landfills or are burned with other waste products. A San Francisco start-up company called Rothy's, however, turns this plastic waste into environmentally friendly shoes. Roth Martin is the company's co-founder. He explains how they turn plastic into soft material for your feet. They take the plastic, clean it, and break it down into small pieces. Then they press it through a device that makes soft fibers. Those fibers are then combined, or knit together. This is done by a three-dimensional knitting machine. It is designed to reduce waste while making the shoes. The knitted fabric and the inner part of the shoe are then attached to the shoe's outer part, called the sole. This outer sole is also made from environmentally friendly material: responsibly sourced no-carbon rubber. Rothy's shoes are sold online. They are flat shoes, with either a rounded or pointed toe. They come in different colors and designs. They cost either $125 or $145 per pair, depending on the design. After American actress Gwyneth Paltrow discovered them last year, the demand for the shoes grew. Martin says there is no shortage of material to fill that demand. "We're not going to run out of water bottles any time soon. So we have an infinite supply of material, and I think that bodes well for our future." When the environmentally friendly shoes wear out, customers can return them at no cost to a company that uses the recycled materials to make other products. For now, the shoes are only available to be shipped in the United States. However, the company says it will add international shipping in the near future. We think he'll turn into a top-class player. The past few days had really worn him out. There's no shortage of ideas when it comes to improving the education of children. Talks with business leaders broke down last night. 1.The knitted fabric and the inner part of the shoe are then attached to the shoe's outer part, called the sole. The school is attached to the Normal College. 2.However, the company says it will add international shipping in the near future. The President will visit China in the near future. We hope to move to the country in the near future.